Today is Perfect Picture Book Friday where I link up with Susannah Leonard Hill’s fantastic group of writers who contribute a picture book review and related resources. Millions of Cats is the oldest American picture book still in print! When the man and his wife leave it up to the cats to determine who is the prettiest, mayhem breaks out and the couple run into their house! Will the cats be able to choose who is the prettiest? Will the old couple get the cat that they want? The fact that this book is over EIGHTY years old and adults and children still love it and it is still in print! Kudos to Ms. Gag! The Story! The results of the catfight are somewhat grisly…but the underdog (or should I say, undercat) wins out…through modesty and non-violence…definitely an important message for today’s world! Last week I shared the Valentine Boat made from a shoebox. Plain brown paper bags also make very versatile (and inexpensive) craft projects for kids. 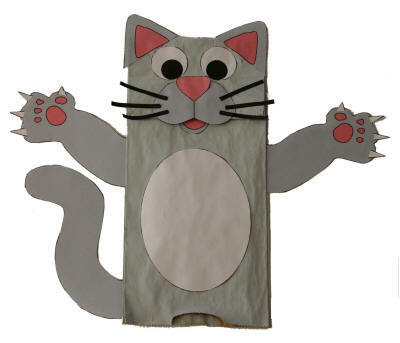 I found this awesome cat made from a paper bag here: http://www.dltk-kids.com/animals/mbagcat.htm Dltk-kids.com a wonderful resource for craft ideas. You will need: Plain brown (or white) paper lunch-size bag, 2 pieces of construction paper (one should probably be black for the eyes and whiskers and the other can be pink…or any other color your child would prefer), glue, scissors, crayons or markers. 1. Cut from the black paper: 2 pupils for the eyes and 6 whiskers. 2. Cut from the other color paper: 2 eyes, oval stomach, nose, 2 triangles for ears, several small circles for the paws and a small triangle for the mouth. 3. Place the closed bag with the open end down and attach the eyes, nose, ears, mouth, paw pads and whiskers with glue. 4. Use marker or crayons to draw the line from the nose to the mouth and add other lines to make the bag more cat-like. When dry, this cat-bag can be used as a puppet for role-playing or as a snack bag for a special book-reading picnic where Millions of Cats is read aloud! Bern at Momto2Postlildivas: http://www.momto2poshlildivas.com/ for her Sunday Showcase link-up that provides parents and teachers with an unbelievable array of crafts for kids. I hope you will take a few minutes and visit these great bloggers…they all have important things to say…and they say them very well! 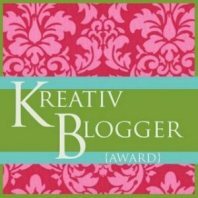 This entry was posted in children's picture books, Companionship, Crafting with Children, Kreativ Blogger Award, Liebster Blog Award, Perfect Picture Book Friday, Reading with Children and tagged Children's literature, Millions of Cats, Susannah Leonard Hill, Wanda Gag by viviankirkfield. Bookmark the permalink. Thanks, Eliz! They are really special, aren’t they? wow that book is 80yrs old already, still in print? Talk about classic! Makes me want to get one for our little one’s book collection. Enjoy the awards…you deserve them! Wow, she looks innovative just looking at her. She must have been well ahead of the game in her day, it sounds brilliant. I used to live in a house with too many cats I can relate lol. And that cat is a great idea, thanks! Yes, I didn’t know about Ms. Gage until I checked her out before doing the review. She must have been a very courageous young woman…quite an inspiration for us all! Glad you liked the book and craft…I always love to match up a simple craft that kids will enjoy making after they hear a special picture book! Congrats on your Unlikely Valentine story!!!! Congratulations on the contest! Your entry was really great! I can’t wait to read this book. Your review is wonderful. I love rhyme, too! Glad you liked the book review today…it’s a really special story with a great message. My aunt who never married had a boatload of cats in her house. We have cats on our farm. Always have. Our inside cats have died. Which broke my heart in two. But this book sounds wonderful. You know I have to get it. So thankful it is still in print. Excellent activities too. Thanks for the congrats…the contest was the first writing one I had every entered (except for 5th grade when I won a school writing competition for an essay about a fire). I was immediately drawn in by the title — and was astounded to learn that the book has been around for so many years, and I’ve never encountered it before! I must rectify that. Thanks for bringing it to our attention! Glad I uncovered a classic picture book treasure…as I mentioned to Penny, I’m glad my choices seem fresh to most of you…even though most of them have been around 30, 40, or many more years. Millions of Cats is definitely still in print…there are lots of copies avallable (especially the newer paperback editions) for very reasonable prices. Your craft activities are just awesome! I am a sucker for cat books. How could I not love a book about BILLIONS of cats that has endured 80 years! Wonderful choice! Thank you, Joanna. Glad you liked the activities (was so happy to discover the Public Broadcasting link where you can hear…and see…the story). Love that book, and love cats! Great choice and great activities. Thanks for posting. Wow the oldest picture book still in print? That’s inspirational all by itself! Love your activities. Delightful post all the way around!! 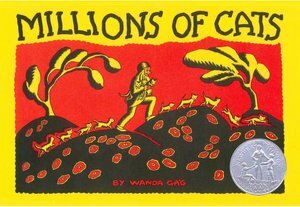 Until I did some research, I hadn’t known it was the oldest PB in America…but I had always loved Millions of Cats. 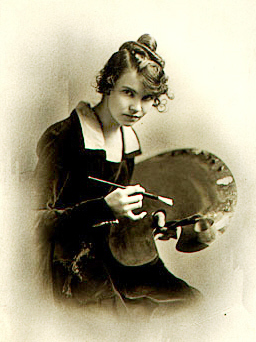 Wanda Gag was definitely a courageous woman, quite ahead of her time…when most women were in the shadows, she stepped up into the light and made groundbreaking changes in an industry that was not female-friendly. BTW, what an awesome contest on your site…I’m super excited!!! I really love your blog…if I can’t go to France and Portugal and the UK, at least I can get a beautiful flavor of them on your site! Thank you so much Vivian for these awesome awards. It’s so great to be recognized by great peers in the field. Love reading your blog. Oh, I LOVE this book, Vivian!!! One of my all-time favorites! Thank you for posting it. I love getting some of these oldies but goodies on our list. It’s unbelievable to me, but some people don’t know Millions Of Cats, or Mike Mulligan, or Caps For Sale! And they are all such treasures. And as always, I love your activity 🙂 Thanks so much for sharing! So glad you liked it, Susanna. BTW, thank you so much for the wonderful Unlikely Valentine Contest…it was a blast to write the entry and even more fun to read everyone else’s. You are a special person to organize all of these contests and other “stuff” for writers, illustrators, parents and teachers! Kudos to you! Lovely post, Vivian. That paper bag cat craft is FAB! Thanks Nancy! Glad you liked it…I can’t take credit for the cat craft…but when I saw it, I knew that i would be using it in a future school program…so easy and fun to do…with inexpensive simple materials…that’s what I love! As always,a great review and selection. Can not believe this was written in 1928 and still live on — a real testimony. It sounds like a fun book. And, I love your activities. You are so creative. And the crafting…well, I know kids love arts and crafts…what a wonderful opportunity for their creativity to shine! Couldn’t agree with you more — I have a very old copy of the Wizard of OZ after Dorothy leaves, that dates back to to the early 1900s. It is a treasure. When I walk into a second-hand bookstore and approach the children’s picture book area, my heart actually does beat faster…it’s a love affair that started over 60 years ago and is still going strong! I love older picture books, especially those by Virginia Lee Burton. The illustrations remind me of hers. I’ll have to find this book. Thanks…glad you liked the review! My first book was The Little House by Virginia Lee Burton…I was 3 years old…I still remember sitting on my mom’s lap, turning the pages…it made a lasting impression on me and I have loved picture books ever since. That’s why I am so passionate about encouraging parents to read to their kids every day…it really does make a difference!!!! This book is exactly as old as my grandfather! A lovely story to choose and you have some fantastic activities to go along with it. Thank you. Healther…thank you…so glad you liked the book! I’m not a cat fan, but I love a classic picture book. Stacy…glad you weren’t turned off by the book since you are not a cat fan. 🙂 It does get rather grisly when you think that the millions of cats fought and destroyed each other 😦 all except for the little scrawny white cat who didin’t boast about being the prettiest. Sounds like an amazing book. I’m looking forward to reading this! Thanks for reviewing this! Millions of Cats is a wonderful classic…I’m sure the libraries have copies…but you can get inexpensive copies online…unbelievable that it is the oldest picture book in America still in print. Wow, this really is a book that has stood the test of time. Amazing. Definitely going to request this one. Thanks! The Scholastic site was a superb resource for helping (grand)children understand caring for others. Thanks, Vivian. Glad it was helpful, Marylin!